Mouse bungees are a little-known but essential accessory for professional gamers. They hold and elevate your mouse’s cable, preventing it from dragging and disrupting your aim. If you hate needing to pull your mouse’s cable back into position all the time, this is a simple way to keep everything on lock down. 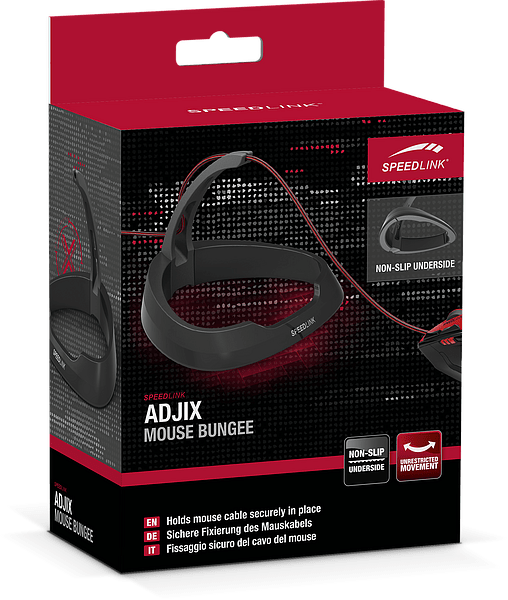 Today we’re looking at a mouse bungee from Speedlink, called the Adjix. The Adjix is made from two materials: hard glossy plastic for the base, and floppy rubber for the top section that actually grips your mouse cord. There are a pair of thin grooves in this section; you can use one or both to secure the mouse cable more or less tightly. So, how does it work? Unfortunately, it’s a mixed bag. The design of the floppy section is ironically quite solid, gripping the mouse cord tightly and preventing it from slipping behind the desk or dragging along the mousepad. The base is not as well designed though, and lacks weight. An adhesive is provided on the bottom of the bungee (remember to remove those plastic sheets!) but we found this diminished in efficacy over time. After several weeks of use, the bungee started to slide around on our desk during high-speed mouse movements. For high-DPI players that move their mouse minimally this may be alright, but low sensitivity players should look for a bungee that uses weight rather than adhesives to stay fixed to a surface. Ultimately, the Adjix won’t appeal to all players. However, if you’re looking for a budget option and you use a high DPI setting (e.g. 1600 or above), then this inexpensive mouse bungee may hit the spot. William Judd :Editor-in-Chief for XSReviews. Find me @wsjudd or on G+.